I get into some major food phases. I’m back in the chocolatey blueberry smoothie (inspired by the original) groove and I think I’ve finally NAILED it. I was on an eggs and avocado toast kick the past couple weeks but lately I’ve been waking up truly madly deeply craving smoothie bowls. I attempted to measure thangs for you this morning so here we go: 1/2 cup frozen wild blueberries, a big juicy medjool date, 1 tbsp hemp seeds, 1 spoonful almond butter (I’ve been using Justin’s vanilla), 3/4 cup frozen spinach, 3/4 cup frozen cauliflower florets, 1 tbsp cacao powder, half a scoop of chocolate Vega Protein + Greens, 1 tsp spirulina, cinnamon, splash of vanilla extract, and unsweetened vanilla almond milk to blend. BOOM! Sometimes I drink it as a smoothie and sometimes I load up on toppings, like cacao nibs, flaked coconut, and granola. I’ve been so obsessed with almond butter lately. No part of me is craving peanut butter. 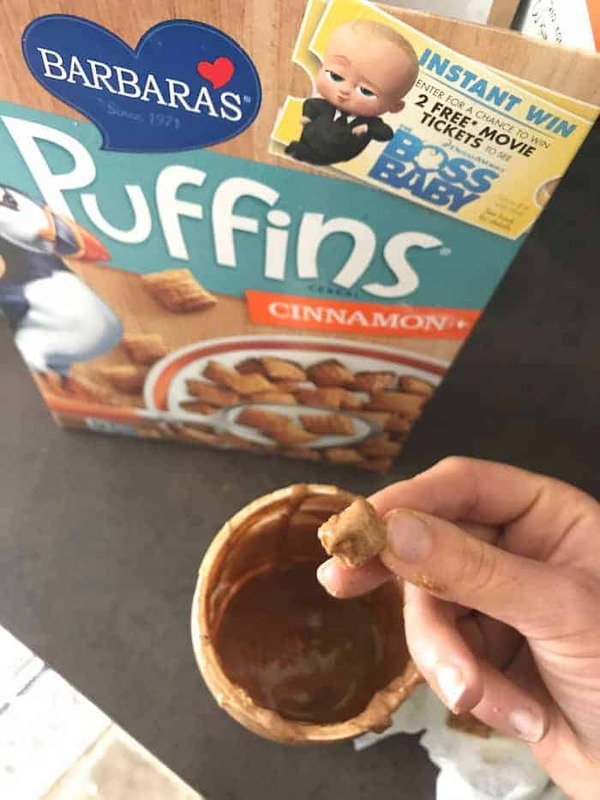 My latest post-smoothie (or during smoothie) snack obsession is handfuls of cinnamon Puffins cereal dipped in almond butter. Legit heaven. I also had decaf coffee (it hurts my stomach way less than regular) with almond milk. Lunch was leftover chickpea pecan taco “meat” (it freezes well) atop cabbage cilantro slaw with carrots, red onion, and avocado. Usually I’d add tons of salsa but we were out. Womp womp. Iced green tea on the side! 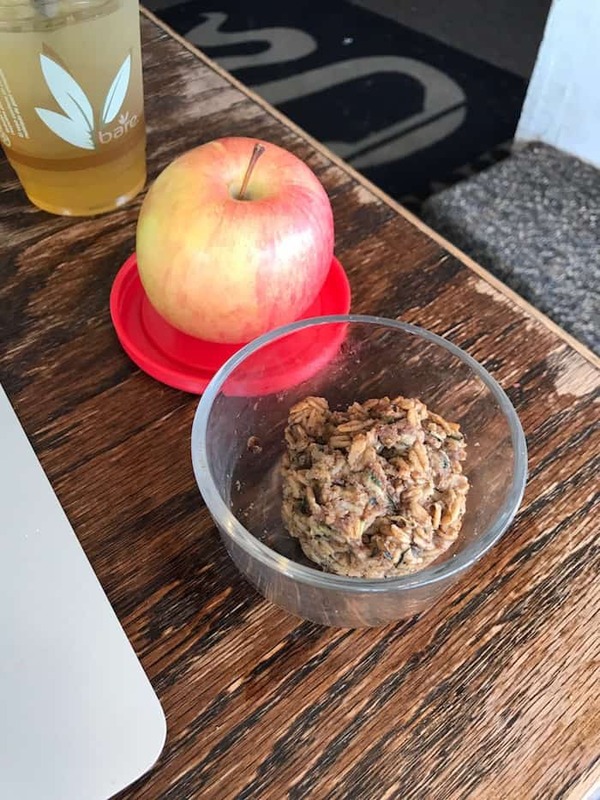 I also had a Banana Zucchini Oatmeal Cup and an apple. Before my last nutrition consultation of the day I ate a baked sweet potato cold straight from the fridge smothered in Sunbutter and sea salt. The best combo!! 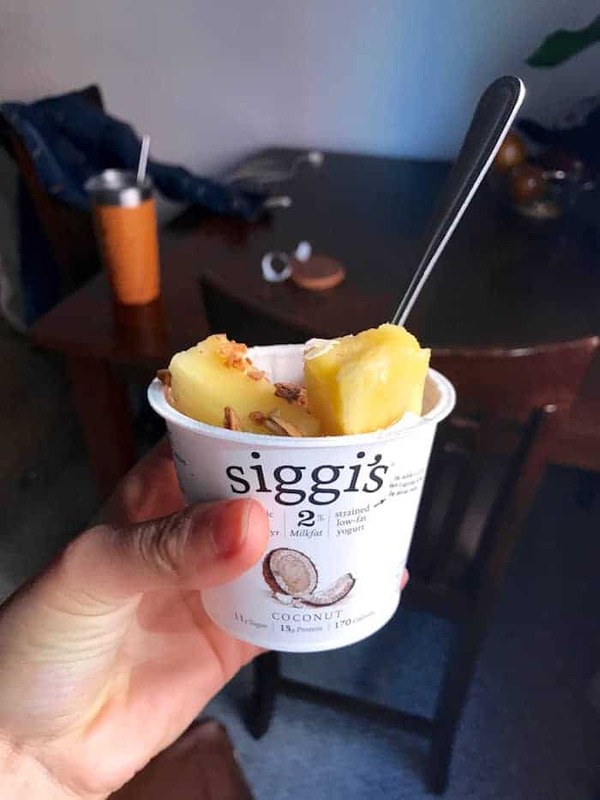 Then before dinner I snacked on a Siggi’s coconut yogurt with pineapple and granola. We’ve been eating suuuper late (anywhere from 8:30pm to 9:30pm) since Jeff doesn’t get home from his Crossfit class until 8:15pm during the week. I like when we eat together so I’ll get to snacking around 5:30pm or whenever I’m hangry and then I’m usually ready for dinner numero dos by the time he’s ready to eat. Compromise! I made some really tasty new things for dinner this week because I felt like our meals were getting too routine. I also bought a pineapple and a cantaloupe, two fruits I never really buy for some reason, and it was such a nice change of pace! I whipped up these Lentil Burgers but added an egg (they looked kind of crumbly), garlic, and Worcestershire sauce to the batter. 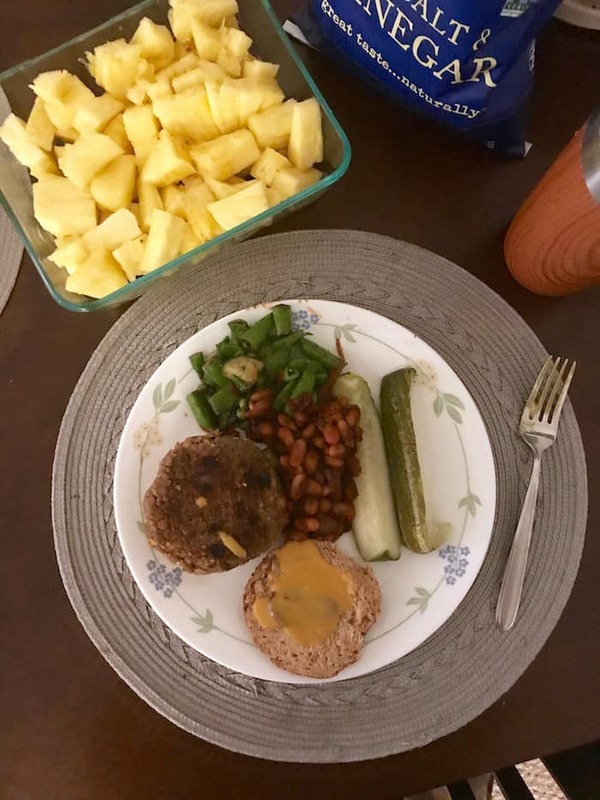 I made five patties and refrigerated them to help them hold together. We served them on Angelic Bakehouse buns with ketchup, mustard, the best pickles, and salt and vinegar chips. I also made these UNREAL homemade baked beans with bourbon caramelized onions. So amazing. Lastly, I whipped up this Sugar Snap Pea Salad but added more dijon and garlic. It was stellar and again, so nice to eat something different! We also ate tons of pineapple and cantaloupe on the side, obviously. Indoor cookout for the win! I always encourage my clients to step out of their comfort zone and explore fun new foods. For some people it’s trying those awesome salted chocolate covered cashews they always stare at and for some maybe it’s buying that pineapple you never buy. Sometimes we stick to routine because it’s easier and requires minimal thought. Sometimes, however, we stick to routine because it’s “safe.” Like I always say, try at least two new recipes and/or foods each week. It’ll boost your kitchen confidence, too! 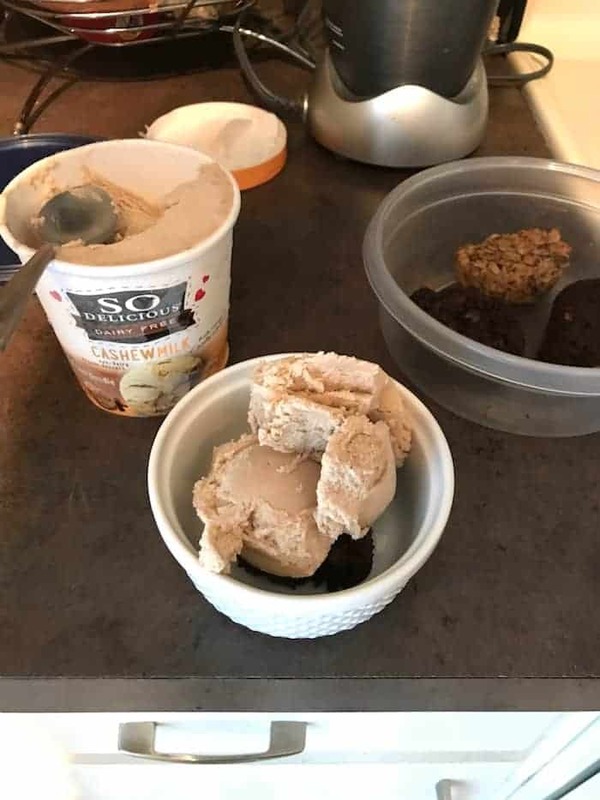 Dessert was a Peanut Butter Zucchini Brownie with snickerdoodle cashew ice cream on top. The best!! I also made a batch of these No-Bake Black Bean Brownies for snacks which I highly recommend. Have the most delish day, pals! I’m getting used to late dinners now since the boyf likes to workout at night too. I kinda like having the extra snack time before hand! Puffins in almond butter sounds straight up MAGICAL. they are so delicious it must be sorcery. Thanks for reading, Juliette! 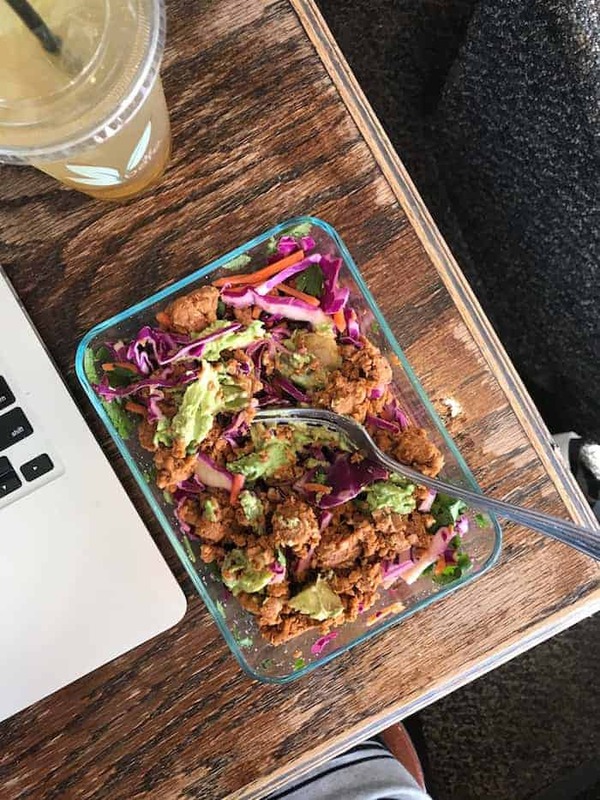 I love trying new foods and try to remember to add a new recipe to my meal planning list each week. IT can be hard not fall into routine all the time. Once zucchini finds it way on sale, I am totally making those brownies! Those baked beans sound AMAZING. All these eats sound amazing actually, being a foodie is the best isn’t it?! Love to it all! I’m convinced the foodie life is the most fun. Thanks for reading, Victoria! YES I love trying new foods! How else can you find new favorites? 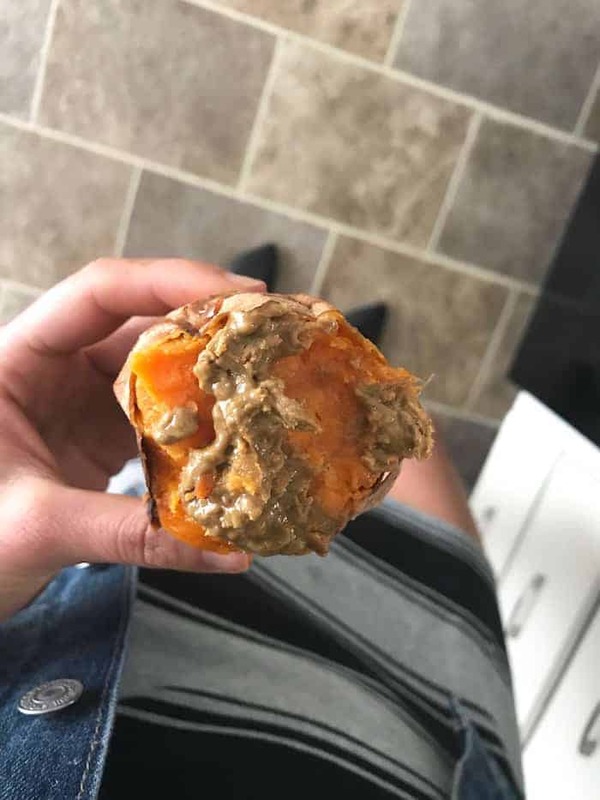 Sweet potato with nut butter is such an amazing combo. I’ll also put butter and or maple syrup on it WITH nut butter- its a killer combo! that sounds like extra savory/sweet amazingness! Man, that So Delicious cashew milk ice cream is AMAZING — every flavor is better than the last! LOVE it! Thanks for reading, Martha. I’m having stomach issues too…decaf is easier on the tum then? I swear the staying lighter later totally switches up my meal clock! And the “meat” is made from chickpeas and pecans…so delish. We eat so much cantaloupe around here – a whole lasts about a day and a half tops! It’s my kids’ favorite fruit (though I’m not sure they’ve met a fruit they don’t like. I’m so glad you loved the Sugar Snap Pea Salad! Thank you so much sharing! Such a delicious day of eats!!! That indoor cookout spread is amazing. I just wanted to let you know that I have been enjoying reading you this year, Alexis! Glad to see eggs and something besides a smoothie, and Puffins are my fave! Thank you so much for following along with me, Olena! I’ve made some pretty big changes and I’m having a blast. when I look for the lentil burger recipe it takes me to a bread pudding. could you help me find it please? Also would the beans still be good without the alcohol do you think? Thank you. 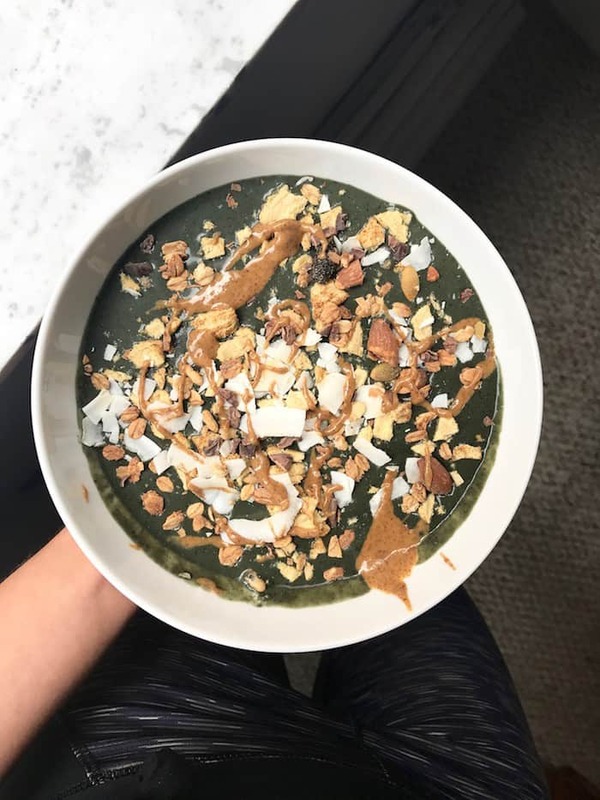 your smoothie bowl looks insanely delicious – i need to get back into adding coconut flakes to mine! they’re a game-changer. i’ve also been absolutely obsessed with puffins (i always have been, but i haven’t gotten them in ages) since they were BOGO at sprouts. i haven’t tried dipping them in almond butter yet though, gonna have to give that a try!! I’ve so been loving coconut flakes with the onslaught of warmer weather! And you simply can’t go wrong with Puffins. P.S. I wish Ohio had Sprouts! I’ve been SO obsessed with puffins, too!! It’s a nightly obsession. Try the snicker doodle ice cream with the puffins. AMAZING. I like your push to try out different foods… It’s so easy to get in a rut! Glad you encourage your clients to step out of their comfort zone! Ever since switching to a plant-based diet we have discovered amazingly, delicious meals that we wouldn’t have otherwise tried. They are now our new faves and taste even better than how we were previously eating. Getting out of that comfort zone is definitely rewarding! Love it! It’s only scary until someone tries something and realizes how amazingly delish all foods (including plant based) can be. Thanks for reading, Rachel! Glad I’m not the only one who gets in food patterns. I’ve been having a zucchini and fruit smoothie bowl for breakfast every morning for, I don’t know – over a year?!? And puffins in nut butter?!? MIND BLOWN! That snickerdoodle ice cream is the best! I love reading about people’s phases with food. It’s such a great sign that we’re paying attention to what our body wants & needs at the moment. Does your stomach do better with decaf because you have trouble with the acidity of regular coffee? I haven’t tried them, but I’d heard cold brew coffee and coffee made from an AeroPress are less acidic.